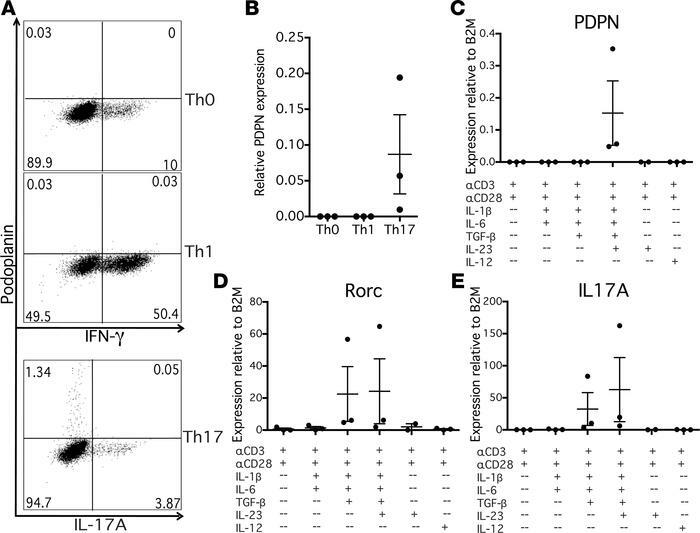 Podoplanin is specifically induced on CD4+ T cells under Th17 conditions in vitro. (A) Naive CD4+ T cells from healthy control peripheral blood mononuclear cells were stimulated with anti-CD3 (αCD3) and αCD28 antibodies, and cultured under Th0 (IL-2), Th1 (IL-12), or Th17 (IL-1β, TGF-β, IL-6, IL-23) polarizing conditions for 1 week. Cells were restimulated with PMA/ionomycin, stained with fluorescent antibodies, and analyzed by flow cytometry. Representative of n = 3. (B) PDPN expression of Th0, Th1, and Th17 cell cultures was evaluated relative to house-keeping gene β2-microglobulin (β2M) by quantitative PCR. n = 3. (C–E) Cells were stimulated with combinations of αCD3, αCD28, IL-1β, TGF-β, IL-6, and IL-23, or with IL-12 and αIL-4 as a Th1 control, and gene expression was evaluated by quantitative PCR relative to β2M. n = 3. Graphs show mean ± SEM.